European society is ageing. More and more older people are requested or even pushed to continue to be active in employment, family, our communities and in wider society. Only by increasing and enhancing their opportunities to engage in learning to better understand their own lives, and their potential can we make the best use of their experiences, skills and talents. With this population change it is vital that we ensure that harmony remains between generations and that there is a better understanding of what ageing means – personally and to the society we live in. It is essential therefore that there is training for those committed to working with older people to enable them to continue to fulfil a role confidently and competently in the world around them. 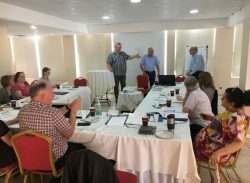 The Pancyprian Cultural and Educational Association-EUROCULTURE will be organising a Trainer the Trainer seminar in Larnaca, Cyprus between 2-6th May 2018, and 17-21st October 2018 to address these issues at stake. The seminar will begin with the participants’ own experiences – you will be asked to create a brief prezi or powerpoint presentation about your work. Your questions and learning needs will be incorporated in the seminar programme. Additionally, you can join the seminar website where you will find 4 knowledge and information modules. The seminar is based on the competence model and self-directive learning. The objective is a better understanding of the role of education in later life related to citizenship and well-being, encouraging active ageing and better communication between and across generations and an exchange of good practice between adult educators, managers, teachers and facilitators. The trainer at the seminar will be Jumbo Klercq, who has been active in a wide range of transational projects since 1989. He was the senior development officer for Odyssee, Vice –President of EAEA and second secretary of ICIP. He also worked as a policy adviser for Stavoor, and has been running his own consultancy agency The Elephant Leaning in Diversity since 2006. He was the coordinator of the European Education network (EEN) and the Pan-European forum of the education for the Elderly (PEFETE) which preceded and directly led to his current involvement in the ForAge network. He has been involved in the training of trainers in several countries.